In the 17th century, it was common practice for wealthy Brits and Scandinavians to embark on a Grand Tour of Europe in order to expand their horizon. With its rough nature and mysterious alpine peaks, Switzerland started to play a key role along this journey by the 19th century. The popular Grand Train Tour of centuries past has seen a revival as of late. Instead of taking several weeks to explore Switzerland (as was common), today's Grand Train Tour of Switzerland provides all the highlights during a trip lasting one to two weeks. But for some globetrotters, spending two weeks in Switzerland is wishful thinking, so we often get asked: "How can we see most of Switzerland in just a few days?" If you insist, here is our recommended train itinerary for Switzerland in five days, starting at the Zurich Airport (ZRH). The country's main airport in Zürich is seamlessly connected to the Swiss rail system. There is an underground train station just steps from the arrival area, including a travel center where you can make reservations for the Glacier Express that you will be using on day 5. If you have not purchased your train pass online in advance, you can purchase public transportation tickets there. The Swiss Travel Pass ticket is available for three, four, eight or 15 days and provides unlimited access to most trains, buses and boats in the country's network, as well as admission to some 500 museums. 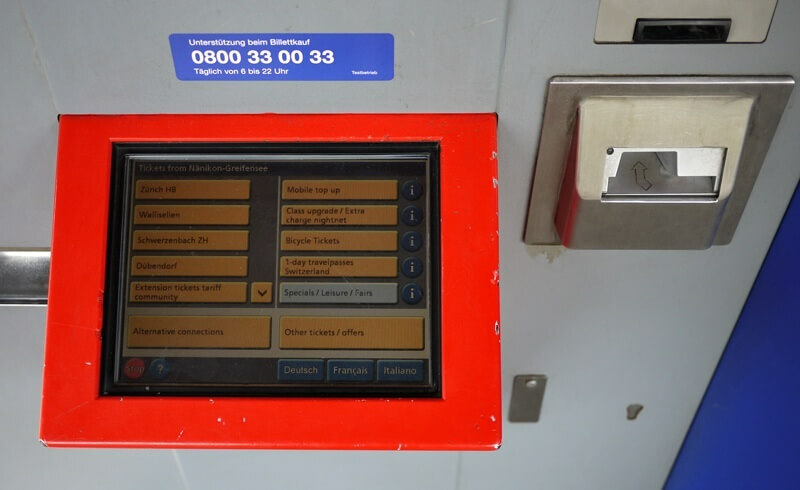 Having it in your pocket makes transferring among the various modes of transportation extremely smooth as you will not have to figure out the ticket machines. But unfortunately, you will not have time to climb very many peaks in just five days. (The pass provides discounts on many cable cars and funiculars, apart from trains.) With this itinerary being five days, I would suggest a one-way ticket to Lucerne combined with a four day Swiss Travel Pass which is valid in all these places. Once you are all set at the Zürich Airport train station, find the right track for the direct train to Lucerne (or switch once at Zürich HB). Sit on the left hand side in the direction of the train, because your first leg will include a scenic stretch along Lake Zürich. The rest of your first day will depend on the time of arrival - and your level of energy. Our recommendation for a half-day trip from mid May to autumn is the following circuit: From Lucerne's main station, take a train or boat to Alpnachstad (both are included in your pass). There, hop onto the steepest cogwheel railway in the world to Pilatus Kulm (50 percent discount with your pass). From the top, enjoy the views of the surrounding alpine peaks. You are at 2132 meters above sea level, after all! On your way down, you could take the cable car to Kriens, from where you will hop on the bus to Lucerne. (The bus is included in the Swiss Travel Pass, but the cable car ride will be discounted at 50 percent.) Alternatively, take the cogwheel railway back to Alpnachstad. Today, you will be riding the GoldenPass line to the canton of Bern by crossing Mt. Brünig. After a morning stroll through Lucerne, hop on the "Luzern - Interlaken Express" which leaves on an hourly basis. You will be passing three lakes as you cross the Brünig mountain pass: A small arm of Lake Lucerne called Alpnachersee, followed by Lake Sarnen and Lake Lungern. On the other side of the pass, expect epic views of the gigantic mountains that make up the Bernese Alps. In case you left Lucerne early in the day, make a stop at the town of Brienz. We have often paraded along the turquoise lake (the trail starts just outside the station by the boat dock). It is a very nice walk with truly superb photo spots. But do not spend too much time here, because you have to make it to Spiez for your overnight stay. At Brienz, hop back onto the "Luzern - Interlaken Express" headed to Interlaken Ost. There, make a transfer to a train headed to Spiez, the final stop for the day. You will be waking up in the charming town of Spiez by Lake Thun. I can guarantee you that you will feel the urge to take a stroll or do some souvenir shopping. And my itinerary does not prevent you from doing so. Just keep in mind that your next destination is in Switzerland's south where the palm trees sway... Tough choice! Depending on which train connection you pick, today's leg from Spiez to Locarno will take between three and 4.5 hours with a transfer in Domodossola, Italy. Be ready for a scenic train ride which will be briefly interrupted by two major tunnels: The Lötschberg tunnel (14.6 km) before descending to Brig, and the Simplon tunnel (19.8 km) connecting Switzerland to Italy. Domodossola is worth a visit on its own - especially on a Saturday when the historic center is buzzing with the weekly market. Here, you will be transferring onto the Centovalli railway which will take you all the way to Locarno. My family used to spend our summer vacation in a stone house in this valley. From the windows on the right hand side, you will best see the impressive slopes of this remote valley. You might want to have an early start on day 4 as you will be traversing more than one mountain on your way to St. Moritz. If you are traveling from mid June to October, you should gear for the Palm Express departing in Lugano. This four hour bus ride to St. Moritz will cross the scenic Maloja Pass. Here is more information, including the mandatory reservation form and a timetable. All others should transfer to a postal bus in Bellinzona. Look for a bus headed to Chur, but remember to get off in Thusis. 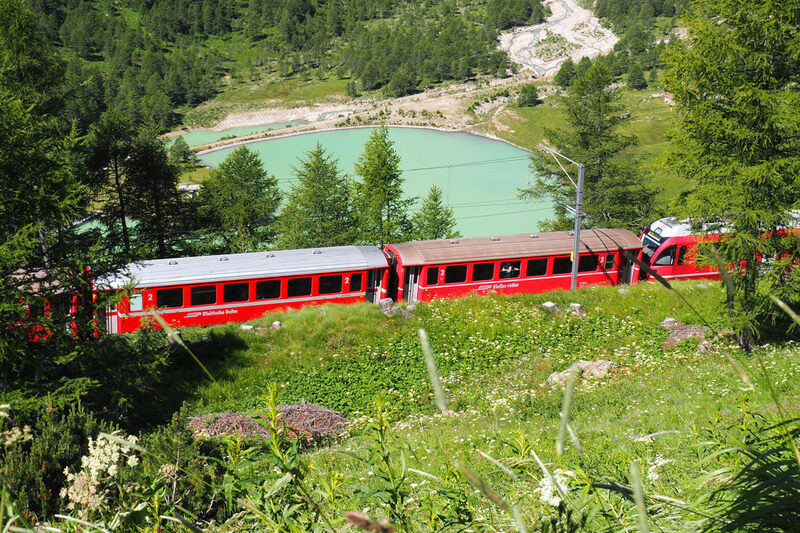 There, you will be transferring to the Bernina Express train bound for St. Moritz. Your Swiss Travel Pass also includes buses, so there is no need to buy a ticket for these legs. Regardless of which option you pick, the views will be amazing and this day will surely leave a lasting impression. Needless to say, you are crossing from the Italian speaking part of Switzerland into the canton of Grisons where Romansh is the dominant language. St. Moritz is a ritzy hot spot and you will surely enjoy the rest of your day there. For your final day of train travel in Switzerland, get ready for a bucket list experience: The Glacier Express train a.k.a. the world’s slowest express train. For instance during winter, make a seat reservation on Gex 903 leaving St. Moritz at 9:15 AM. Exactly 6 hour 25 minutes later, you will need to part with this panoramic train at Brig where you will transfer onto a regular train headed for Lausanne. If you had just one extra day, I would suggest going all the way to Zermatt on the Glacier Express. But on a five-day pass, this extra loop to see the Matterhorn is simply not feasible. Either way, the ride on the Glacier Express across nearly 300 bridges, through 91 tunnels, alongside green meadows, remote villages and untouched nature will leave a lasting impression. This is the ideal stretch to lean back in your seat and gaze out the window. 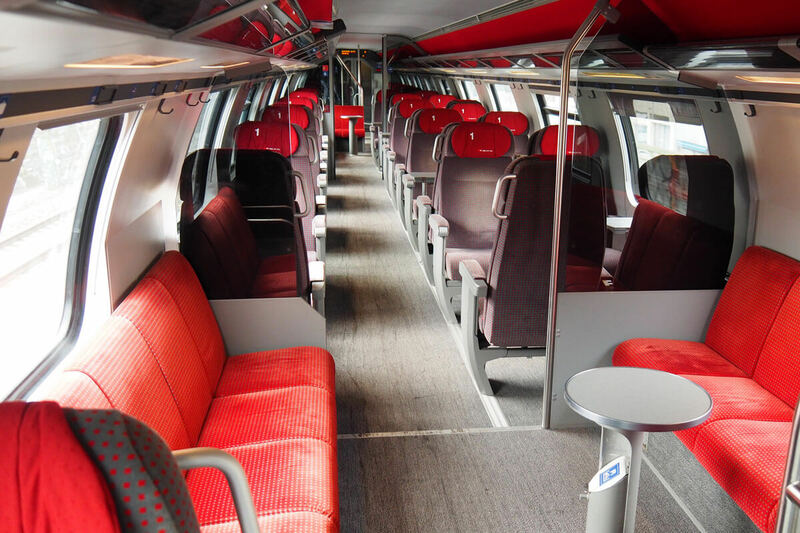 And by the time you make it to Lausanne at 5:43 PM, you will be glad to check into your hotel and hit the spa... Lausanne is located within one hour of the Geneva airport (GVA), and there is a straight high speed train connection to Paris on TGV Lyra. Finally, I would like to stress the importance to reserve your seat on the Glacier Express ahead of time. This route is usually fully booked during peak travel seasons. In case you are traveling on a Swiss Travel Pass, the reservation fee is included. The ideal itinerary to experience Switzerland by train will require at least eight days of travel. But this five day itinerary is also a possibility and allows you to maximize the country's dense rail network.